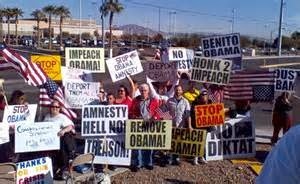 Protest Obama Visit to San Bernardino | Stop Obama Now!! Obama is expected to be in San Bernardino on Friday for a private meeting with families of the victims of the terrorist attack. We are organizing a protest. The details will be posted here when available. We will have many extra signs, if you need a sign.